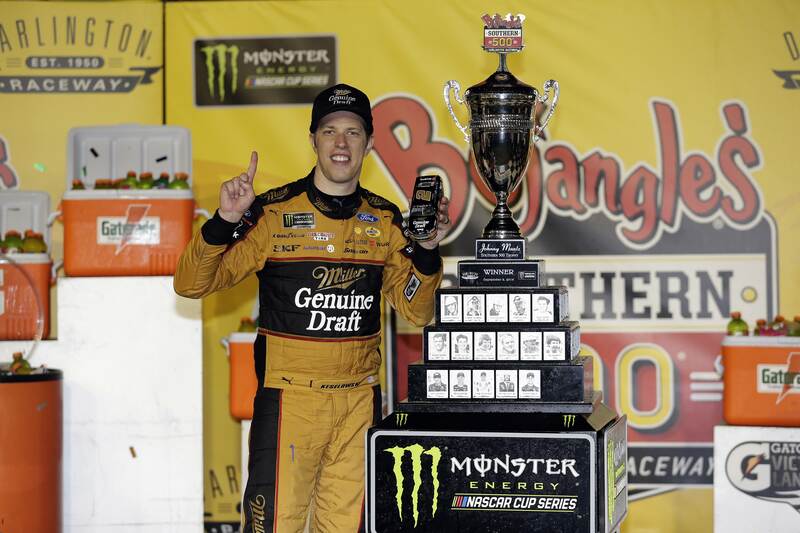 On a night that celebrated seven decades of NASCAR competition, Brad Keselowski put on a truly vintage performance worthy of the history books at Darlington Raceway. Running inside the top six virtually all race long, the 33-year-old Rochester Hills, Mich. native was determined to score his first win at Darlington in his No. 2 Miller Genuine Draft Ford Fusion. Patiently biding his time as the conditions transitioned from dusk to dark, Keselowski found himself in the top three in the waning laps of this crown jewel event. Placing fifth in Stage 1 and second in Stage 2, the 2012 Cup champion kept on the offensive against dominant race leader Kyle Larson. Like a bandit in the night, Keselowski’s No. 2 pit crew snatched the top spot from Larson’s No. 42 team with a great pit stop and exit from pit road on lap 346. Ultimately, that well-timed stellar stop by the No. 2 team put Keselowski in a position to win the Southern 500. On the ensuing restart, the aggressive racer dropped the hammer, willing his Ford to a definitive lead into turns one and two. Keselowski’s victory was more special because Team Penske hadn’t won at Darlington since 1975. Just as special was the fact that this winning No. 2 car resembled the No. 27 Pontiac fielded back in 1990 by Blue Max Racing and driven by current MRN personality Rusty Wallace. "To win here and to win wearing in Rusty's colors and driving his car, I feel like I'm kind of in a dream from when I was 10 years old,” Keselowski observed. “It's something I will carry forever. It's probably the biggest win of my career." The fun at Darlington doesn’t have to fade away. Lionel Racing proudly presents the opportunity to pre-order a car that truly defines how teamwork makes the dream work! For an MSRP of $54.99, fans can order Keselowski’s No. 2 winning ride in a standard Action Racing Collectables finish. Meanwhile, fans wanting to get the features found in an Elite 1:24 car can pre-order this historic Ford Fusion for an MSRP of just $89.99. Both cars will feature race damage that’ll make you feel like you were racing at one of NASCAR’s most treacherous speedways. Sure, this year’s Southern 500 may be in the books, but that doesn’t mean a winning ride has to pass you by! Make that pit stop at LionelRacing.com or dial 1-800-952-0708 so you can pre-order Keselowski’s No. 2 ride and party like it’s 1990! Diamond Membership: The 1 Year Anniversary Discount has ended, but you can still upgrade below!